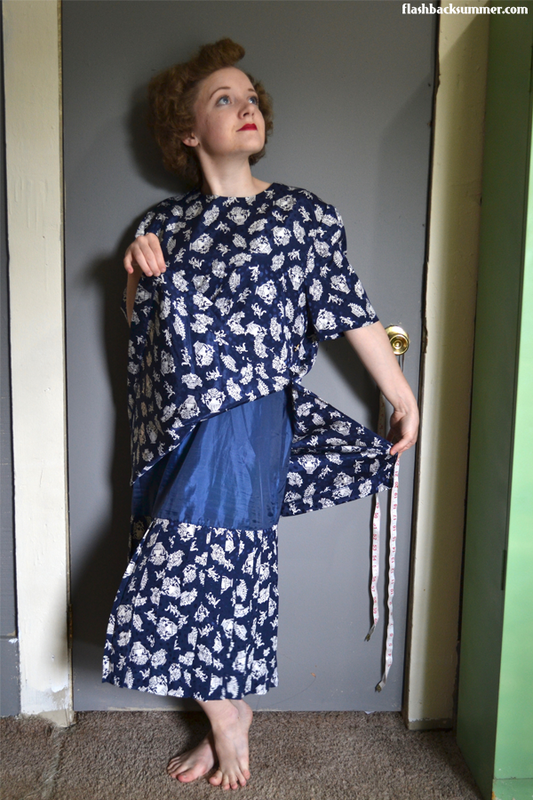 One of my goals made during Fashion Revolution week was to give more ugly 80s and 90s thrift store items new life. Since many of them are hideous, it requires creative upcycling in order for them to avoid the landfill. 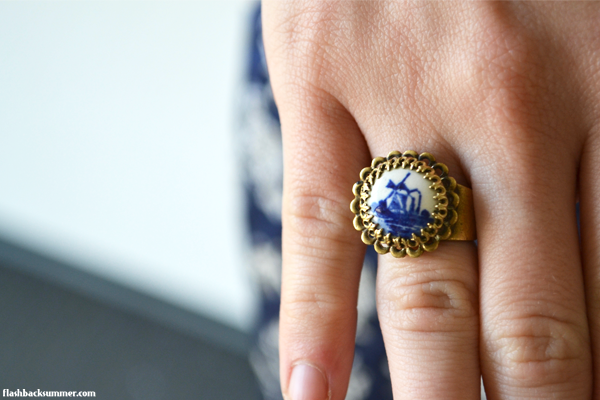 "Upcycling" doesn't mean just "reused;" it means making an item more valuable than it was before. I think this definitely applies to this project! Not only does it have shoulder pads (which I promptly ripped out for use in 1940s projects coming up), but it also came with a bunch of buttons on it that I can save for later. Never throw out notions! 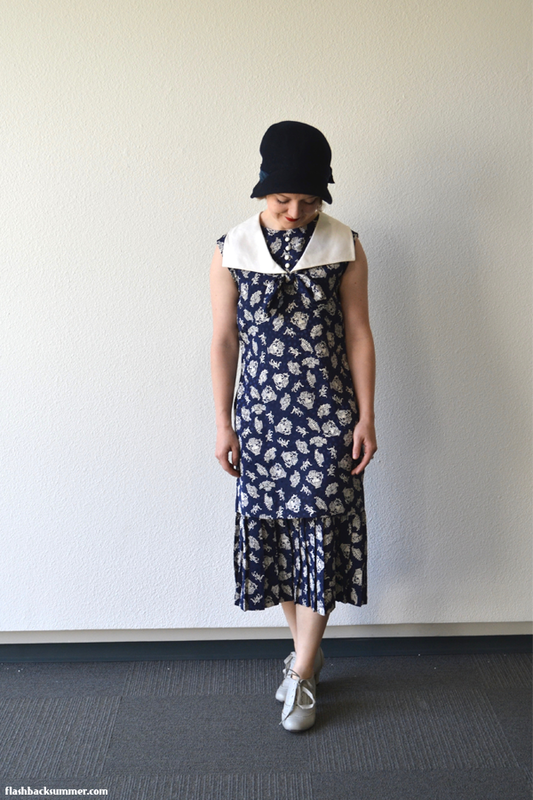 I originally planned to make a dropped-waist 1940s style dress that utilized the pleated part of the skirt (huzzah for modern chemically-set pleats that don't need to be re-ironed!). 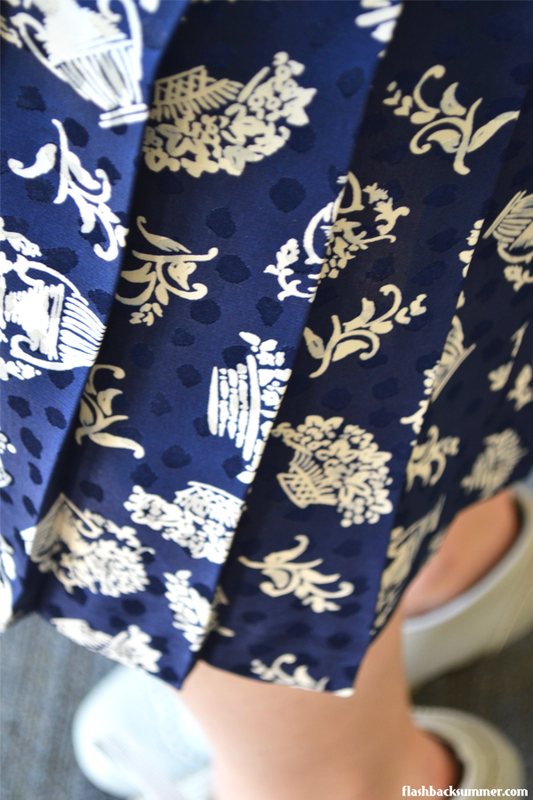 However, when I got the dress home I realized that while it is sort of a two piece dress.... the lining is attached at the neckline to the outer fabric, and the pleated fabric doesn't go up very far on the bottom layer. So.... it wouldn't be long enough for a 40s skirt. New plan! I decided to go for a "cusper" type of dress that can be styled to look either 20s or 30s depending on how it's accessorized. I brought in the sides to make a more fitted silhouette along the hips and a tiny bit at the waist. I added a deadstock 1960s collar that is wide enough to balance out my hips as far as proportions go. I also put on some buttons at the neckline to help simulate a v-neck line that is more flattering for my round face without having to rework the neckline of the dress. Lastly, I removed the sleeves and used the sleeve heads as ties for a bow under the collar. It took me about a day and a half to complete and I used items from my stash. The dress has a step-in zipper at the back, but the collar opens at the front. Therefore, wanting to avoid reworking the collar and zipper altogether, I tacked the collar down to the dress on one half, then the other half detaches to allow the neckline to open at the zipper in the back. The collar is snapped back on with a couple snaps behind the bow on the bodice. It worked out pretty well! 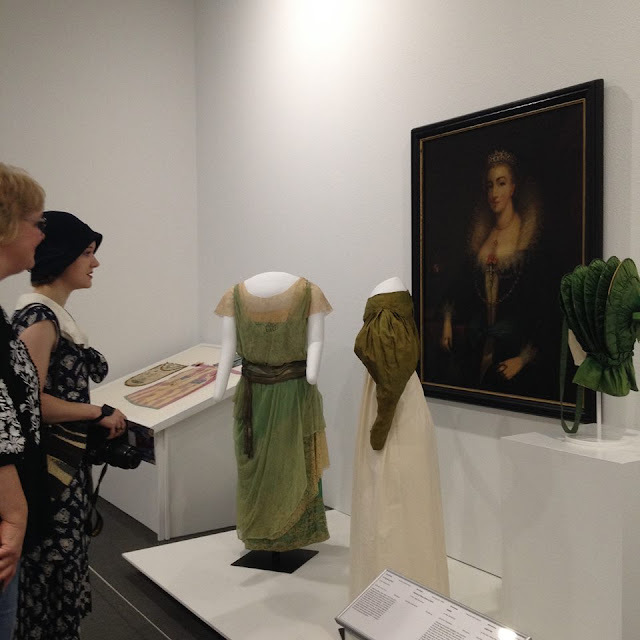 Obviously, it isn't a perfect reproduction of a 1920s dress. 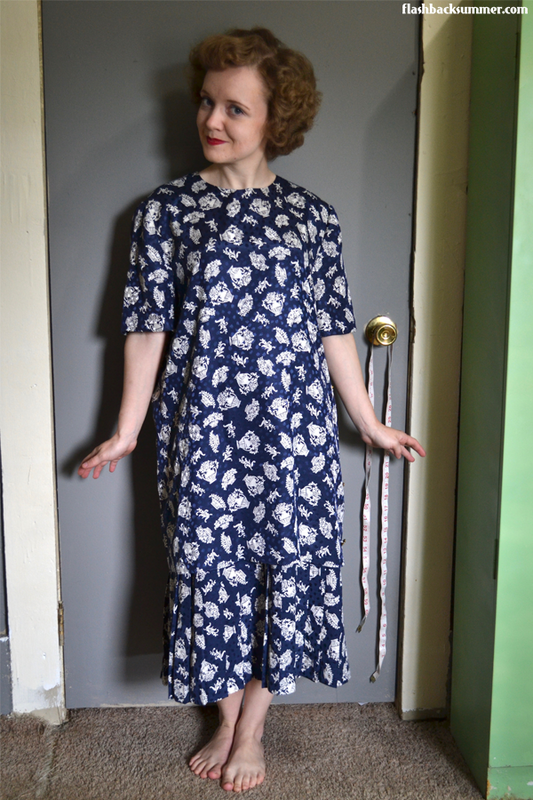 The 20s didn't use mile-long nylon step-in zippers, polyester shiny materials, or serged seams. However, for $4... I think I've captured the vibe pretty well, so I'm happy! 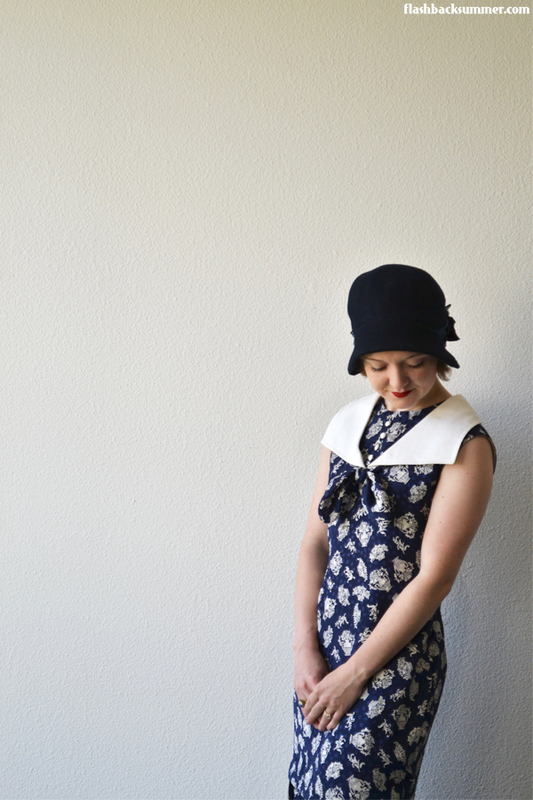 Today I styled it for the 20s, but I'll show you a more 30s aesthetic in a future post. 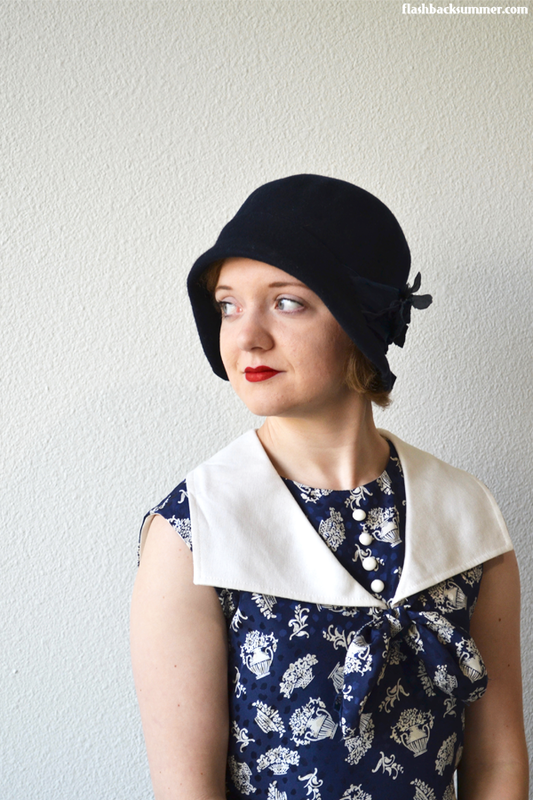 To get the 20s look, I rolled with the baggier silhouette and threw on a cloche and some dolly lips. 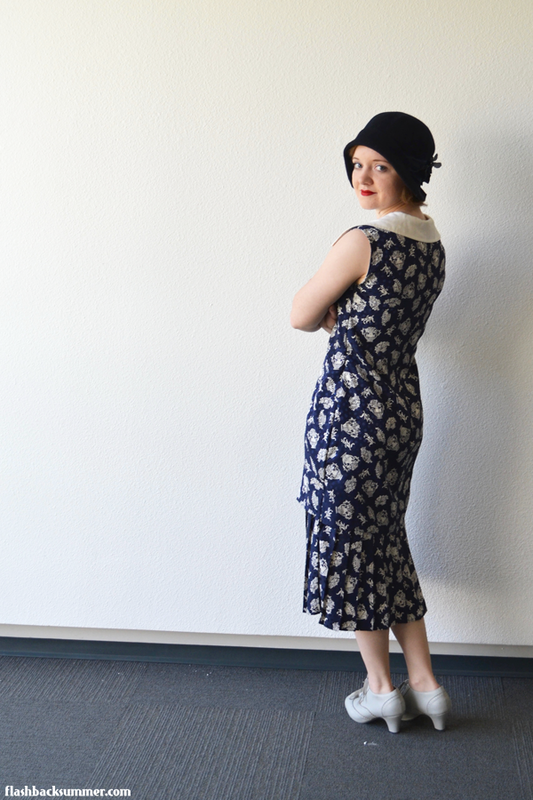 It's a super easy outfit and I'm proud to say it's the first 20s-style dress I've made that I actually like! I always have problems trying to balance out my hips and create a longer-looking silhouette, but I think this one works! 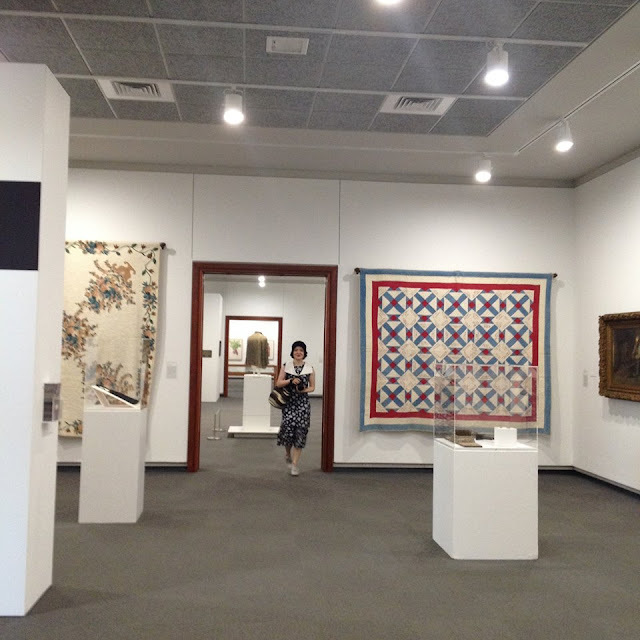 I wore it to a local museum's textile exhibit and drooled at all the historical clothes. You have to get very close to see stitches... but I'm not actually touching them, so it's okay, haha! Oh man. This.is.amazing! This is probably one of my favorite things you've done to date! 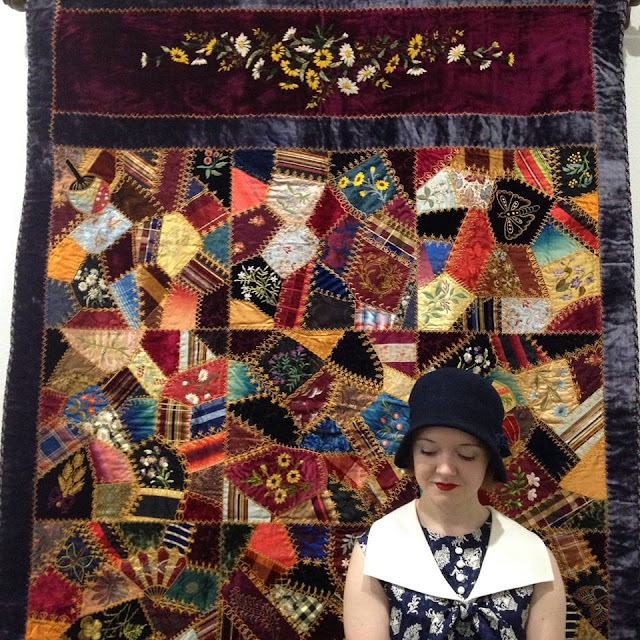 I love the 1920s or 1930s vibe (the way you've styled it here could easily work for the very early 1930s too!) 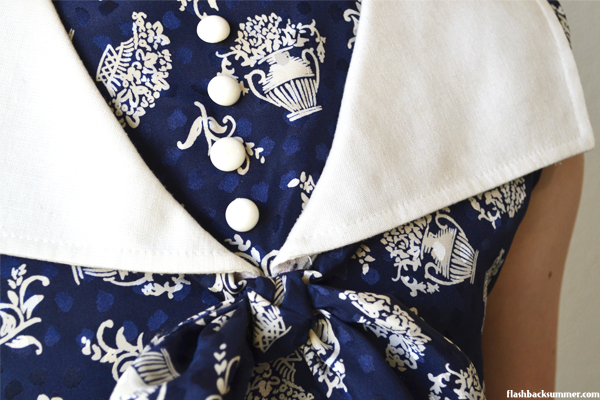 and the details on the neckline are just fabulous. Well done!! Yes, I like the "cusper" styles from when the 20s was evolving into the 30s. I'm going to go for a more mid-30s look on my next accessorizing attempt! Luckily, these tunic dresses kept popping up throughout the decades. Love it! It was quite hideous before and you totally transformed it! Holy cow that looks AMAZING. 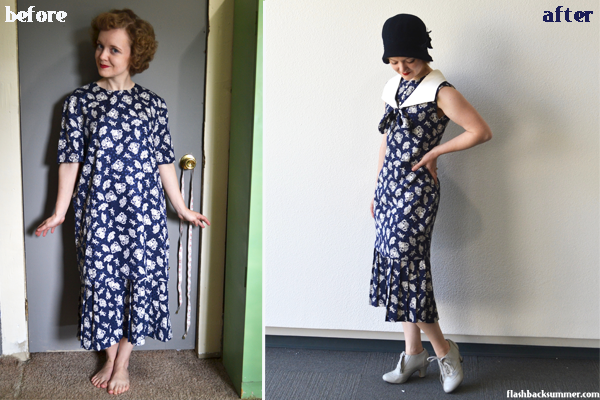 I love me some 20s dresses as they're so comfy, but I don't know if I would have thought of doing that to such an ugly 80s thing. Kudos all around! Great upcycle! It looks gorgeous on you and saved some pretty fabric. It's so much more economical to get supplies at the thrift store. I've even read sewing bloggers who buy swimwear for the bra padding because it's water-resistant and so much cheaper than the fabric store, even discount ones. I'm eager to see the 40s outfit you're making! Incredible! I love this dress so much! You look absolutely perfect. What I find so impressive is that ay first glance it looked like you had completely reworked it, but you actually made fewer changes than I thought! It just shows that clever ideas are the main thing! I absolutely love this outfit. Very inspiring! EXACTLY! When I rework something, I want to do as little work as possible, unless I'm just taking something apart for fabric. Just not motivated to put hours work into an 80s dress, haha! Thank you, glad you're inspired! omg i love transformed the dress and it looks so good! It looks great! I really wish I had this kind of skill. Wow, thank you for the kind words, Porcelina!!! Excellent job!! I never would have recognized that as having been an 80s dress. Very cool! This is so amazing! I actually had to show my mum because I was so impressed. You've done such a fab job of upcycling such a horrid 80s dress and making it into something really gorgeous. You've inspired me to look at some of those horrid outdated second hand clothes in a different light! Aw, thank you Cate! I'm glad it turned out so well. Yes, turn the horrid clothes into fabulousness!!! What a wonderful transformation you have achieved with this dress Emileigh! Beautifully done! Your after looks so much better. Great job! That's great to hear! Goal accomplished! This is such a fabulous re-make. You have created something so lovely from something so horrid! Sooooo awesome! Great refashion - so creative. This style, this era, and the whole outfit suits you so well. I know the feeling - it does make one feel so satisfied to turn something unpleasant and dumpy into something much better, doesn't it?! Btw, I too have those same shoes and I love mine, they're so comfy and sturdy especially for dancing! This is really cute. 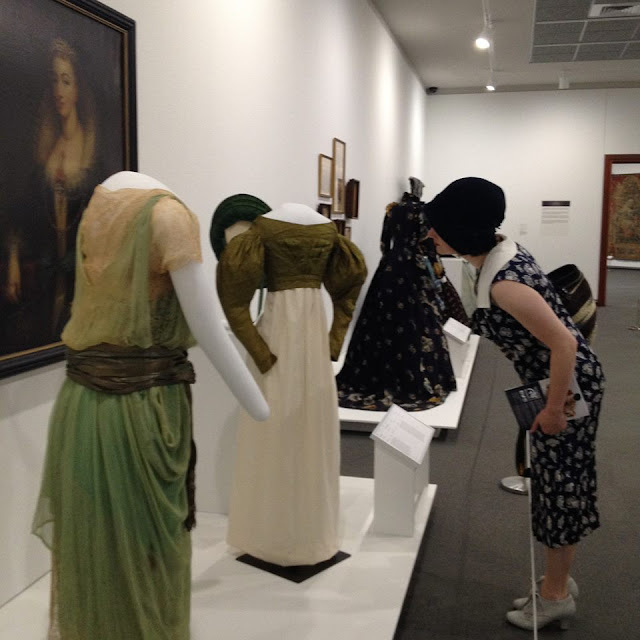 I think the 1920s styles really suit you. I'm very impressed. That dress is amazing! You look just like my favorite silent film star, Janet Gaynor.